While global concerns rise over the impacts that human activities have on the environment, an increasing number of ICT practitioners, researchers and technology advocates are exploring the potential of these tools in the response to climate change. In the midst of the imminent, yet uncertain climatic conditions, interest in mitigation and monitoring strategies is now combined with the urgency of learning to cope and adapt to climate changes, particularly in vulnerable developing environments. It is in this context that research on the role of ICTs in climate change is starting to flourish through a number of projects and initiatives, supported mainly by international organizations and NGOs around the world. Some of these can be found in a report commissioned by the International Telecommunication Union (ITU) titled ‘ICTs for e-Environment’. ICT use to forecast and monitor the impact of natural and man-made disasters, particularly in developing countries, LDCs and small economies. 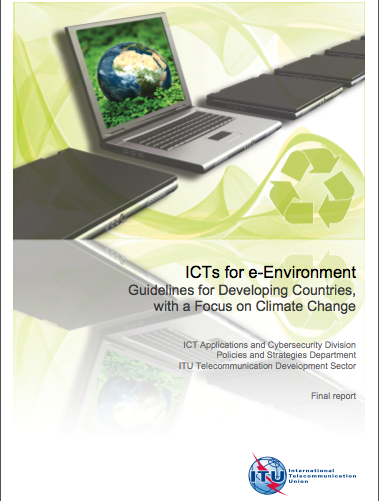 Building on this definition, the 2008 ITU report provides a comprehensive account of ICT activities and applications that indicate the impact of ICTs in the environment, as well as their role in mitigation and adaptation efforts. It also provides a set of recommendations aimed at strengthening the capacity of developing countries to benefit from the potential of these tools in the context of climate change. The document is an important contribution to a flourishing field of enquiry, and constitutes a great starting point for further in-depth research and discussion. ICTs & Carbon Footprint: ICTs can help to significantly reduce greenhouse gas (GHG) missions while increasing energy efficiency and reducing the use of natural resources (through travel replacement, dematerialization and reduced energy consumption). ICTs & Human Activities: While ICTs are essential to our understanding of the environment, further research is needed to understand the long-term impacts of ICTs on human activities. ICTs & Decision-Making: New technologies such as geographic information system (GIS) and a new generation of web-based services are having a profound effect facilitating decision-making. ICTs & Connectivity: Broadband Internet connection is a key tool to support environmental research, learning and decision-making. ICTs & Developing Capacity: Developing countries face important challenges in taking advantage of ICT tools in their response to climate change. It is necessary to strengthen their mitigation and adaptation capacity, while helping them to achieve the Millennium Development Goals (MDGs). ICTs & a Holistic Approach: Its necessary a comprehensive and integrated approach to global environmental action through access to ICTs and new management practices to avoid duplication of efforts. 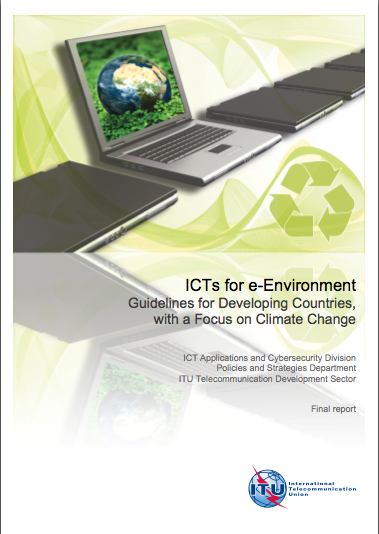 ICTs, e-Government & the Environment: It is necessary to raise the profile of environmental issues within ICT strategic planning initiatives at the national level, particularly in e-Government initiatives. In view of the growing international attention to developing country needs and perspectives, the report provides a good opportunity to reflect about how to effectively engage developing stakeholders in the analysis and implementation of climate change actions and strategies. Beyond the provision of guidelines or recommendations, how can the international community work hand in hand towards joint action in the e-environment field? This question includes stakeholders from the Government, civil society and private sectors, as well as the international donor community. Six years and many international forums have passed since the 2003 WSIS, and although important progress has been made, and we are still facing the challenge of firmly positioning the ‘e’ as part of the environment discussion.